1. Halloween or Harvest celebrations: Are you an enthusiast or noncommittal in these fall events? And if you celebrate, what are your favorite activities? If by “celebrate” you mean gorging on butternut squash lasagna, autumn bisque, and apple crisp while wearing 90% fleece, that’s a resounding YES. 2. If you could single-handedly bring back one fashion trend just because it fits your personal style, what trend would you return to the runways of Paris and Milan and why? Oh, gosh… Personally, I feel incredibly fortunate to live in the era of leggings and will weep oceans when they go out of style. Leggings are the most socially accepted form of pajamas that exist. 3. How many full manuscripts did you have to write before you were first published? 1.5. To clarify, I wrote my first ms and then rewrote it from page one using the “bones” of the original premise. 4. Name your favorite celebrity crush from high school. What made that performer/athlete/political leader so dreamy? Luke Perry. I blame his swoony sideburns and the whole bad-boy-with-a-heart-of-gold persona. 5. Preferred writing location: home office with total silence, public place with plenty of white noise or some other combination? I love writing at home! When weather permits I sit out on my screen porch (which is basically a giant tree fort since I live in the woods). But for the other ten months of the year, you can find me in my office with a wee pot of mini orchids on my desk. 6. Favorite more recent popular fiction heroine: Katniss Everdeen (The Hunger Games trilogy by Suzanne Collins), Stephanie Plum (Stephanie Plum series by Janet Evanovich), Eve Dallas (Eve Dallas/In Death series by J.D. Robb ) or Hermione Granger (Harry Potter series by J.K. Rowling)? 7. Name your favorite way to stay in touch with your readers. Ideally, it would be nerding out with them at book events! But on the social media end of the spectrum, I’d say Instagram is my fave. 8. Extra-large French fries or a perfect square of dark chocolate? Gahhhh! Dana, this is like a Sophie’s Choice question! Okay, fine. I’ll take the lifetime supply of extra-large French fries, please. 9. Have you ever, even for a moment, forgotten that one of your characters was…you know…fictional? 10. Picture yourself standing at the edge of the Grand Canyon. Now describe what you’re doing right now: cheering in a victory stance, leaning over for a better view, or turning pale and curling into a fetal position as far as possible from the edge? Cheering in a victory stance! While I’m not height-phobic, I still have a healthy respect of them. 11. Property Brothers or Big Bang Theory? I haven’t seen either—I swear I’m not a bot! Most recently, I binge watched (and adored) Ozark. 12. Which character from one of your own books do you wish you were more like? Irina Dmitriyev, the Russian piercing artist in SUMMER OF SUPERNOVAS. She’s the kind of fearless girl you’d want to help carry out your bucket list. 13. Name a movie you’ve watched countless times but one you’ll still tune in to whenever it’s on cable. Bridget Jones’s Diary. It’s a siren to my soul. 14. 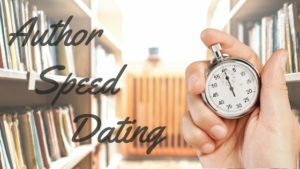 When did you first decide you were a writer, and when was your first book published? About six years ago. On a particularly dreary day in February, I sat down and tried writing. I’ve always been an avid reader, so imagine my surprise when WRITING turned out to be my oxygen! 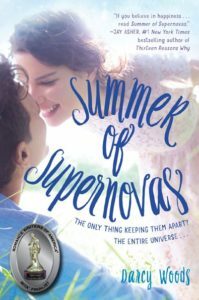 Then SUMMER OF SUPERNOVAS was published in 2016. 15. If you could keep only the possessions that would fit in one suitcase, and you were limited to two books – one you wrote and one by someone else – which titles would you tuck inside your bag? Explain your choices. Oof. That’s a toughy. Well, since I only have one title out, SUMMER OF SUPERNOVAS it is! As for another author’s, I’d probably coin toss Maggie Stiefvater’s THE SCORPIO RACES (heads) against THE ACCIDENT SEASON by Moïra Fowley-Doyle (tails). Two fears have plagued me from the time I was little, and today I must face one of them. It’s not the clowns. A lot of kids get squeamish around clowns, I know. But no one else at Jessica Bernard’s seventh birthday party screamed bloody murder and wet their pants at the sight of one. That’s when I earned the nickname Wila-pee-na. The nickname’s quasi-forgotten—thank heavens. Though the fear of clowns is not. Still, what I’m about to tackle is worse. Way worse. Carefully I take my place at the top of the water tower, letting my bare legs dangle. The early summer breeze rushes to greet them. One hundred and twenty feet stretch between me and the ground. My pulse doesn’t even flicker. I wish it did. Because heights are a perfectly reasonable fear. Beneath and around me, the water tower spikes like a bulbous-headed nail from an otherwise tidy landscape. The aging white reservoir once proudly proclaimed CITY OF CARLISLE. But since most everyone, except me and the elements, has forgotten the old tower, it now reads: ITY OF CARL. I adjust the wrinkled towel underneath me since the metal of the six-foot wide circular platform is equal parts rust and chipped pant. It’s not as if I planned on coming up here—and certainly not in a dress—but driving by on the way to Hyde Park . . . well, I just had to stop. Because for all the structure’s imperfections, it does manage to get one thing right—the view. From here the world is utterly perfect. Unfolding the yellowing paper, I smooth it over my lap. My astrological birth chart’s intricate and faded markings offer nothing I haven’t seen a million times. I do it out of habit, because the placement of every planet and its degree is as well-known as the location of the nose on my face. And there it is: The queen mother of all my fears. The Fifth House. Much as I’d rather bury myself in the study of astrology and its role in the human experience, I can’t avoid reality any longer. Because the clock is ticking. I have precisely twenty-two days. Twenty-two days of planetary alignment to find my perfect match. SUMMER OF SUPERNOVAS, a May 2016 release from Crown Books for Young Readers, may be purchased through these retailers: Amazon, Barnes & Noble, IndieBound, Powell’s, Kobo and iBooks. 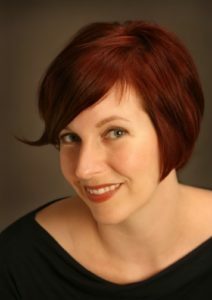 DARCY WOODS has held an eclectic mix of professions—from refueling helicopters for the U.S. Army to recharging bodies and spirits at a spa—but her most beloved career is being an author. She lives in Michigan with her madly supportive husband, two tuxedo cats (who overdress for everything) and a closet full of neatly organized shoes. SUMMER OF SUPERNOVAS is her double RITA®-nominated debut young adult novel. Stay in touch with Darcy through her website, www.darcywoods.com, and through Twitter, Goodreads, Instagram and Facebook. Sign up for her newsletter here.